In case you're just tuning in, I've started an annual blog series on brand design trends. Over the past four years, we've designed over 150 small business brands, and have discovered some repeating patterns along the way. About a year ago, I had the idea that I wanted to start some sort of annual publication to track popular design styles and talk a bit about them. This blog series is the result of that idea! I realize a series like this could certainly be taken the wrong way, so if you’re just tuning in, you should check out our first post and read about our intention for this annual series, and also take a look at our first trend! The trend I’m going to talk about today is my absolute FAVORITE!! For so long, I felt like type design was mostly a fan-favorite of design communities, but not fully appreciated by the general public. However, I’ve noticed a huge shift in the creative community over the past year, and more often than not I’m asked to design special letters for clients based on classic fonts. Not only has it allowed me to grow as a designer, and feel the liberty to experiment with type, but its also been my own source of inspiration when I look at current branding trends online. Who doesn’t love a beautifully crafted typeface?! So today, instead of just showing you examples of custom type, I wanted to do a post about the different styles of type. The sky is the limit in how you personalize these classic styles to compliment your own unique style! I’ll also give you some examples of the most well-known styles in each category that will assist in your typography research before your next big project. 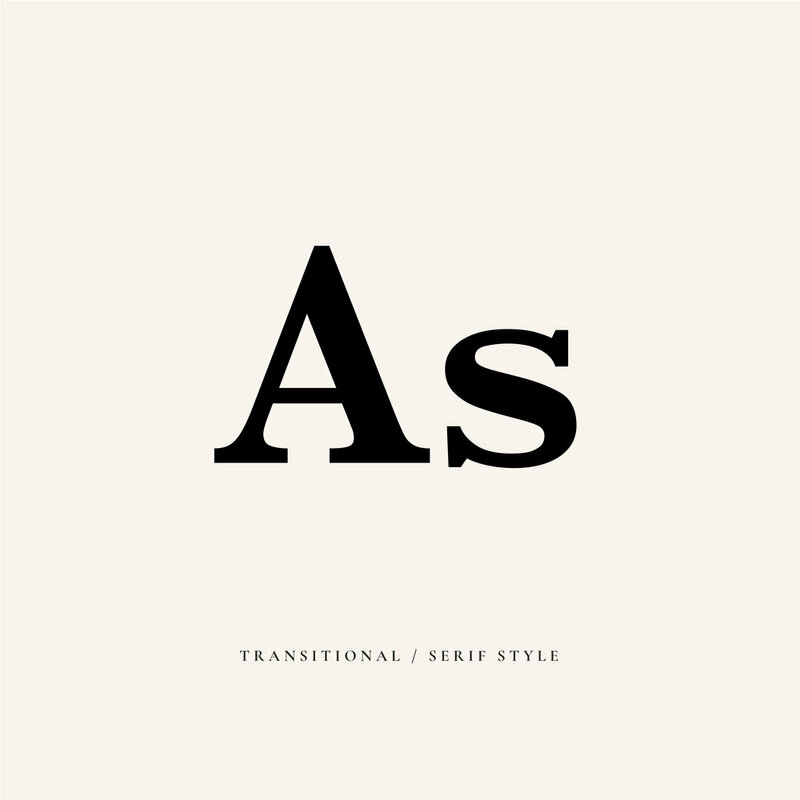 A serif style is a typeface with serifs on the ends of each letter. A serif is a small decorative line attached to the basic form of a character. Some serifs are subtle, while others are dramatic, but each one adds just a bit of embellishment to letters. Old Style serifs are based on the first Roman letter forms. With a diagonal stress line, this style mimics the natural slant of a scribe using pen and ink. There’s lower contrast in the letters, which means the thin part of the letters tend to be heavier. This style is considered the best for large amounts of body text - think of your favorite book or newspaper. This serif style was established by John Baskerville (recognize that last name??) True to title, it represents a transition away from the old style as new printing techniques allowed for finer strokes. These fonts are a mix between old style and modern fonts, and have a vertical stress with more dramatic contrast than the old style. This style is usually referred to as “editorial type” when I first meet with clients to talk about creative direction. They are considered modern serif styles, and are characterized by high contrast between thick and thin strokes, with dramatic shapes. Often, you’ll find little flourishes and “balls” at the end of a stroke. This style became popular during the wave of advertisement in the 19th century. They have heavy brackets at the end of the basic character, and no transitions. Changes in stroke are so subtle, that it often appears to all be the same weight. This type of style has minimum stroke weight, and a triangular serif design to make the letter look like it flares at the end. This is a category of type styles that don’t use the serif embellishments. Common in web design and children’s books, these simplified letterforms are a bit easier to recognize. 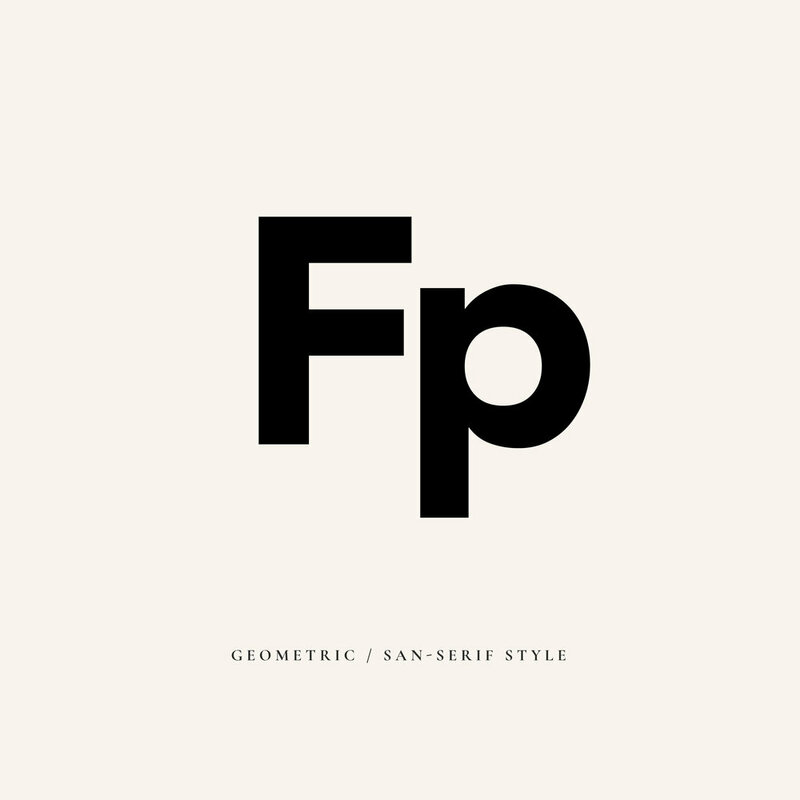 This is the first popular style of san-serif typefaces. There’s a slight square in the curves and lowercase g’s have the “bowl and loop” characteristic. This style has a more dramatic square shapes, but similar proportions to grotesque fonts. This style has the same proportions as Old Style serifs, but without the serifs. There’s more contrast between the stroke weights and many believe this is the most legible san serif typeface, because of their calligraphic influence. You guessed it - this style is influenced by geometric shapes. It’s a bit harder to read, so avoid using it for large groups of text. When we first begin working with a client, we identify what they value as a business owner. Our goal is to create a brand that accurately portrays the business it represents, and so we first have to get to know that business and what it stands for. Characteristics such as quality, collaboration, relationship-building, loyalty, service, empathy, compassion, and creative expression might indicate that hands would be appropriate to communicate those values. As a throwback to 17th century writing styles, this script is often used for fancy invitations and awards, as it gives the text an elevated and elegant feeling. An alternative to a formal script, the casual script style is informal, and usually looks like handwriting or brush lettering, with a flow from one letter to the next. Pro-tip: I find the best handwritten casual fonts on Creative Market! This style mimics traditional calligraphy, but doesn’t go quite so far as formal script. It usually appears to have been written with a flat-tipped calligraphy pen. 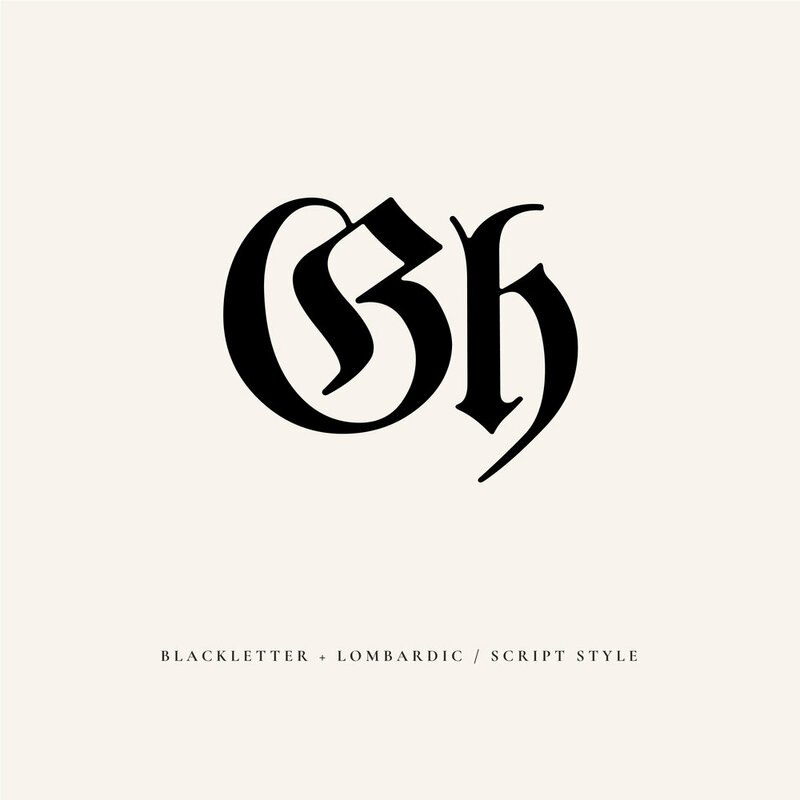 This style of gothic calligraphy is influence by pre-moveable press type. Sometimes this style is referred to as “Old English,” this style is also most associated with classic manuscript drop caps! Almost all experimentation with type that falls outside of the above categories (serif, san serif, and script) is classified as decorative type, and should be limited to headlines and logos. These styles are popular for advertisements, signage, and packaging, when you want to make a bold statement, evoke a specific feeling, or allude to a particular culture or time period. These styles should be used sparingly, as they are most likely to fall in and out of fashion, but it’s a great way to bend the rules of type and make letters that showcase your personality! Marked by its heavy texture and mismatched proportions, grunge typography first became popular in the 90s with punk rock. This style is marked by chaotic spacing, blurred lines, and heavy strokes. David Carson, the Godfather of Grunge, would rip, shred, and remake letters to cause his viewers to stop and reconsider typographic rules. An evolution of the grunge font trend, handlettering takes the texture and deconstruction of grunge type, and uses calligraphic letter forms and ornate styles to create a hand-crafted look - taking the world by storm. Breaking out of the confines of typography, handlettering encourages us to view each letterform as a work of art. Vintage and retro typography add a particular time stamp with iconic letterforms and trends of the past. Typically, advertising trends from the 20s to the 80s bring back feelings of nostalgia and can immediately evoke a particular belief, lifestyle, or purchasing habit. When looking for typography inspiration, I have a few trusted sources to get the wheels spinning and ideas flowing! Typewolf is a blog that “helps designers choose the perfect font combinations for their next design project.” With a focus on web, Typewolf features new sites that are getting it right with type, and offers a checklist course and digital products to help you find the perfect font pairing. I’ve referenced this blog time and again as I look for font alternatives, explore different combinations, and learn what it means to adapt typography for a digital experience. The second place I go to find type inspiration is Pinterest (shocker!) With so many designers uploading new logos and fonts to play and explore, it’s an endless source of inspiration as I research and imagine what my custom type project could look like. Popular among designers, Dribbble is a great place to keyword search graphic design for inspiration and suggestions. Not only can you scroll for type inspiration, but you can get a glimpse for how type is used in different ways. Similar to Dribbble, behance is a graphic design portfolio showcase site, where you can search for different typographic styles and see how other designers are making them their own. As you begin to play with typography for your own brand, make a note of which fonts you like, and see if you can pair them with their type style. Once you find a style that fits the personality of your brand, research different ways that it can be customized to help you stand out. Then, grab a pen and piece of paper and start sketching different type variations to send to a designer to help you create a custom logo font, OR take some time researching the custom fonts available on Creative Market!